Ran another update and its working now. How can I access /usr/libexec/netdata/plugins.d/ to install a plugin? Best way add custom dashboard to /usr/share/netdata/web? Is there a way to transfer the file over ssh? Can't seem to get the update method to work; edit and apply but nothing gets downloaded, when netdata still says there is an update? Does the container get updated automatically when there is an update available? New user, just installed the docker, and the docker fails to start at all. No error in the UI, just says "Exited" right after starting it. Do you have any other working dockers? Same here, it was from a recent update. Pducharme, to get the docker back working go to edit -> advanced view and change the repository from "titpetric/netdata" to "titpetric/netdata:1.5". Takes you back a version but at least it works. Figured out something even better. Removed the netdata docker, checked also remove image, then reinstalled it with the my-netdata template. All is well. I just installed this for the first time, using the template on CA with no modifications. Worked on the first try with no issues. 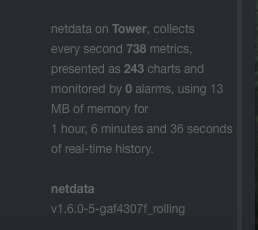 Ive been running Netdata for a while. So far its been great. Giving you a heads up, I've been monitoring the Logfile size using the 'view Docker Log Size' script in the userscripts plugin and it seems to have levelled off at a size of 14MB. it looks about the same as what is reported in the netdata side menu. I've added a screen shot of the side menu report. Apologies beforehand since I'm probably just being a noob, I just started learning Linux this week as I wanted to setup my own home NAS. Anyway, does there happen to be a simple way to add temperatures for the CPU/HDD to this? How can I add cpufreq and temperature ? Please is there a way to add custom external plugins to a directory that can be stored in my appdata directory. I would love to add some HDDtemp graphs and sensor graphs. I've tried many times but my limited understanding of groups and permissions and which internal directory i need to mount outside the docker is severely hamstringing me. I've tried to mount /etc/netdata/python.d and other directories outside docker in my appdata folder and add some external .conf files and plugin files but I'm not getting anywhere. (basically I'm asking for a crash course on the subject). any assistance would be greatly appreciated. Can some of the Defs explain, why this docker needs every day an update, somtimes two on one day? I set it to auto-update and forget about it. How can i set a Docker to Auto-Update?? ?